Arizona Veterinary Oncology is thrilled to share with you the impending launch of one of the most exciting technological advances available in veterinary cancer treatment. Arizona Veterinary Oncology will be the first to make this new technology available in the Phoenix area, which will significantly improve the veterinary community’s ability to helping pets with cancer live longer, healthier lives. 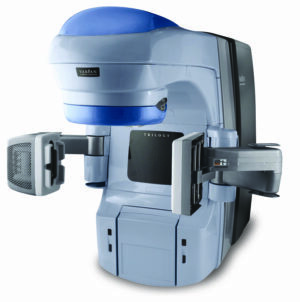 Through a partnership with PetCure Oncology, Arizona Veterinary Oncology is in the process of upgrading their radiation therapy program by incorporating a Varian Trilogy® linear accelerator. This equipment, along with a team experienced in the administration of radiosurgery, will provide access to a treatment that delivers a precise dose of radiation with sub-millimeter accuracy almost anywhere in the pet’s body – with curative intent. The technology has emerged as the standard of care for humans over the past decade and is now in the hands of the highly skilled veterinary specialists at Arizona Veterinary Oncology at the Gilbert location. Radiosurgery solves the major hurdles for cancer therapy delivery for companion animals. Standard radiation currently requires 15 to 30 visits with anesthesia administered during each visit. Many of these treatments are palliative in nature and do not allow for sparing of healthy tissue. Conversely, radiosurgery via the Varian Trilogy can deliver the same or higher dosage in only 1 to 3 visits, and is designed to spare healthy tissue while focusing on curative intent. Arizona Veterinary Oncology anticipates being able to accept patients for radiosurgery in May of 2015. In the meantime, the doors at Arizona Veterinary Oncology are open for collaborative patient care. To learn more about radiosurgery please visit PetCure Oncology.